Thanks so much for visiting my website! Please allow me to introduce myself — I’m Andrea Kojan, and Anytime Cakes is the name of my home-based, cake decorating business! Welcome! My Mom taught me to bake when I was a young girl (thanks, Mom! ), and I've been expanding on that knowledge over the years by taking all sorts of cake-related classes whenever and wherever I am able. I hope someday to be a full time cake decorator, maybe even have my own bakery and/or coffee shop, but for now, I must fit it in around my regular 9-5 job (which I’m also very grateful for!!). In 2008, I became a certified Wilton Instructor, and I’ve been teaching monthly cake decorating courses at the Michaels Arts & Crafts store in Sterling, Virginia. I also occasionally teach privately at birthday parties and at Girl Scout events, as I really love working with kids. I'm a proud member of ICES (International Cake Exploration Society), am a member of the planning committee for the annual National Capital Area Cake Show (located in Northern Virginia), and am totally addicted to the cake decorating message site "Cake Central". I also do lots of other types of crafting -- I make beaded jewelry, do some decorative painting, decorate baby clothes and pretty much do anything I can that’s "crafty"! My creativity comes directly from my Mom and Dad, and expressing it is truly a passion of mine. These days I'm trying to learn as much as I can about HOW to officially -- and legally! 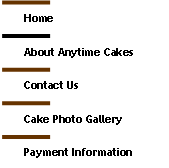 -- run a cake decorating business from my home. Meanwhile, I take sugar art classes, go to cake conventions and watch the Food Network Challenges over and over again to get my "cake fix." I also surf the web and have many online "cyber friends" who love cake decorating as much as I do. And I occasionally paint or make a beaded bracelet or a pair of earrings, just to keep in touch with the rest of my "crafty" side, too! Please feel free to take a look around -- this site is pretty new for me, and things will probably keep changing for a while! I hope you like what you see! !